Custom Wood Furniture - Joe Coholic Custom Furniture Ltd.
Manufacturing high quality furniture is what we do best! 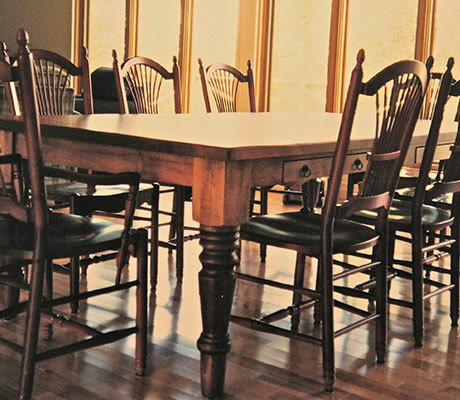 Starting with the finest furniture grade hardwood lumber – we can design and build you any type and style of furnishings. We use a combination of traditional woodworking techniques, along with the most modern of methods & materials, to create furniture that is made not only to look great – but to function day after day for a lifetime or more. Each piece is hand crafted – from the initial design process, to the final finishing and assembly. With several decades of experience, we can assure you are getting only the highest quality when it comes to any type of furniture we create. Any hardware we use comes with a lifetime warranty, and our finish is a modern industrial lacquer which offers a high durability and wear resistance. With our modern CNC capability, we can also offer custom carvings, or decorative aspects that many shops are not able to do.